It's Friday, it's a long weekend, it's 80 degrees out. I think the beach is calling my name! 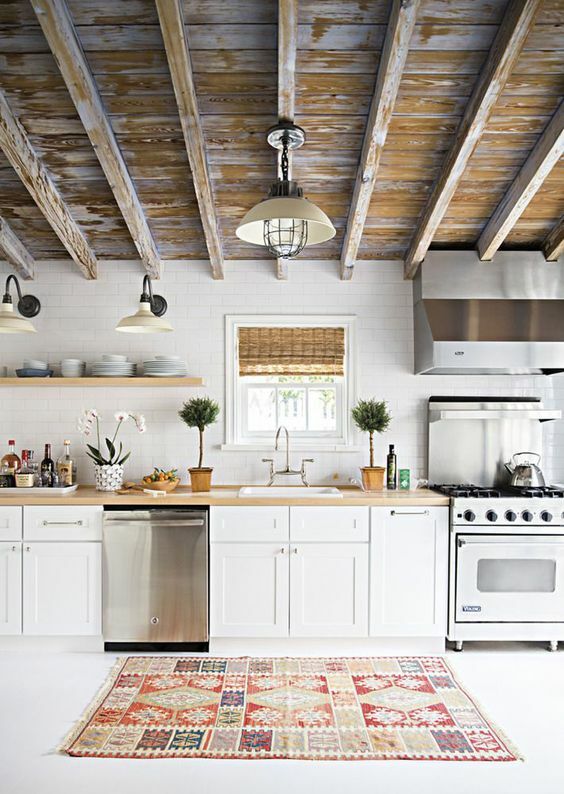 Meanwhile, I'll be enjoying this week's interior roundup. 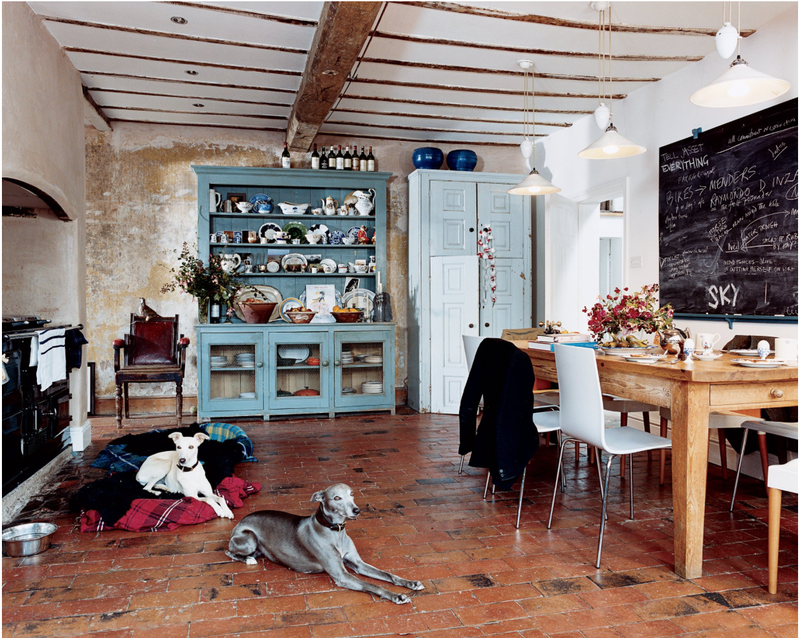 This kitchen represents my dream of a house in the countryside. I think it's the most "dream kitchen" of this list since so much of it's charm from the room itself. It's history is described in the link above. My favorite things are the brick floors, the blue hutch, and of course the two dogs! 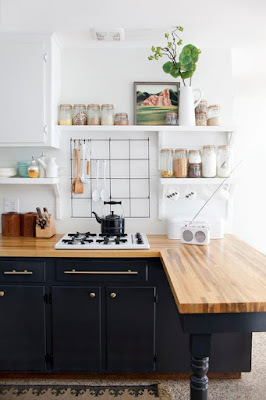 I was surprised at how much I liked the dark lower cabinets in this renovation. It's difficult to note in this picture but they're not actually black, they're dark blue! I think because of the way they created balance with the wood countertops and the stark whiteness of the walls and shelves, they maintained a sense of light airiness which I really enjoy in kitchens. I've also recently been enjoying open shelving, especially when set up this way with some coherency in its contents and the unexpected element of the art piece. In this case (although of course, the beamed ceiling is spectacular!) the rug does a lot of the talking, at least in this frame in particular. This is a also another example of the open shelving which I find incredibly refreshing. 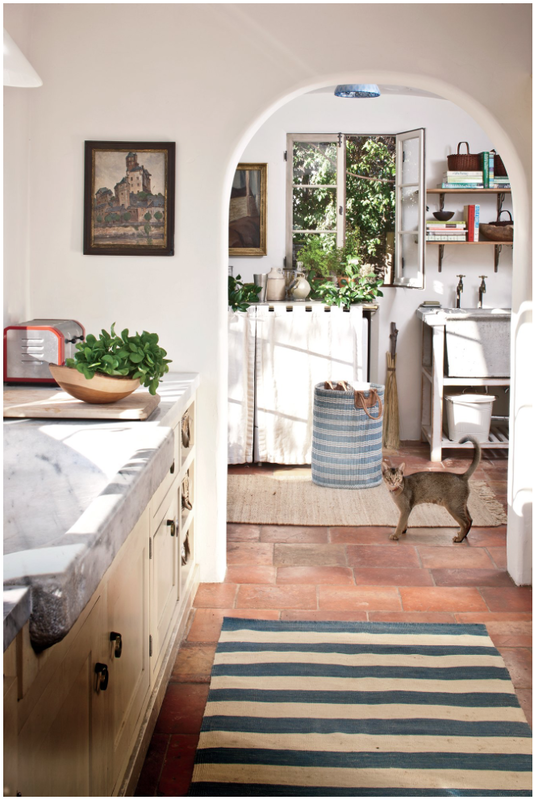 Last but not least this Los Angeles kitchen which actually has a very countryside vibe to it. I like that immensely. The foliage you can see through the window, as well as the rustic floors, the farmhouse sinks, and the artwork are all quite enchanting! I'm basically ready to move in.